The Defense Department has not been ordered to prepare for a full drawdown from Afghanistan, acting Defense Secretary Patrick Shanahan told reporters Monday morning. 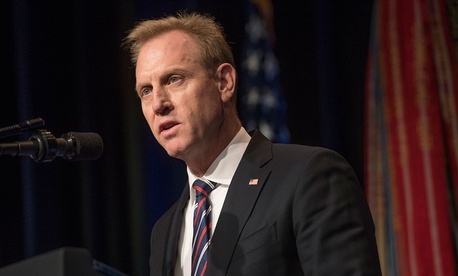 NATO Secretary General Jens Stoltenberg, at the Pentagon for a meeting with Shanahan, also expressed support for the talks but said any talk of removing NATO troops from the country would be premature. American and Taliban officials have agreed in principle to a tentative agreement in which the insurgents would guarantee that Afghanistan would not be used as a staging ground for international attacks by terrorists. This would open the door for a complete U.S. withdrawal if the Taliban further commits to a ceasefire and to talk to the Afghan government directly, according to Khalilzad. While the security guarantee would accomplish a core U.S. objective — indeed, the current Pentagon rationale for the U.S. presence there — getting the Taliban to agree to talk to the Afghan government could prove difficult. The group considers the United States its primary enemy and has dismissed Kabul as a puppet of the Americans. Still, even opening the door to talking about negotiating directly with the internationally recognized Afghan government is a significant shift in the Taliban position. Hanging over the talks are late-December reports that President Trump was thinking about ordering the Pentagon to withdraw half of the roughly 14,000 U.S. troops who are advising and assisting local security forces in the fight against the Taliban. Although the White House denied that any order had been issued — a denial echoed by Shanahan on Monday — such an order could eventually arrive. Trump has long expressed desire to get the United States out of Afghanistan and his unexpected decision to order troops home from Syria raised questions about whether he might take similar action in the 17-year-old conflict. CNN reported late Monday afternoon that the Pentagon is still preparing for the possibility of a withdrawal order. Last week, the Taliban appointed one of its co-founders, Mullah Abdul Ghani Baradar, as its chief negotiator in its Doha, Qatar, office. Released from a Pakistani prison in October 2018 — possibly as part of the peace negotiations — Baradar is a powerful voice within the Taliban whose assignment has been seen as a sign of the Taliban’s seriousness about the talks. Khalilzad told the Times that the two sides had not discussed the possibility of an interim government that might include the Taliban, a concern amongst Afghan officials that the current President, Ashraf Ghani, has publicly opposed. In the meantime, Afghan security forces have continued to take heavy casualties, and two U.S. service members have been killed there this month. Last summer, a three-day ceasefire sparked bullish assessments from senior leaders about the prospect for peace. But as talks have continued, the Taliban has continued to carry out gruesome and effective attacks. The group’s incursion into the city of Ghazni in August was a forceful display of resilience; it killed and wounded hundreds of Afghans and forced U.S. troops to call in airstrikes to counter the assault. A few months later, the top military commander in Afghanistan narrowly escaped assassination in a shooting that killed the powerful local police chief Abdul Raziq.